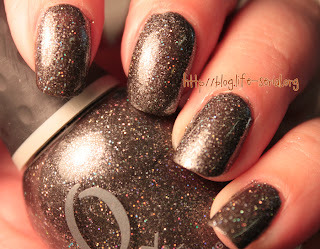 On to a crunchy glitter ORLY! I say crunchy, because it makes me feel like crunching across gravel - Rock Solid, one of the new Mineral FX polishes. This one is two coats, and it dried smoother than I expected it too. It's a gunmetal grey with holo bits and shimmer. I hope I took enough of a variety of photos for your to see all the different glitter/shimmer/holo stuff. It's really pretty when the sun catches it, too.